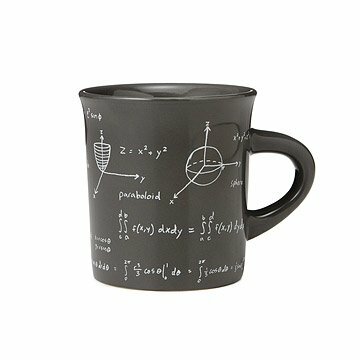 Give your favorite brew an exponential boost with a mathematical mug that features equations and formulas. Give your favorite brew an exponential boost with a heavy duty mug made for the math elite. Featuring equations and formulas ("handwritten" on a chalkboard-colored background) that would make your high school calculus teacher proud, this smart design is perfect for number-crunchers and coffee and tea drinkers alike. Made in China. Son likes the larger size of the mug, the color, and the math equations. Our son loves to drink tea and will definitely smile when he uses this mug. My friend states she will use this item at work and show it off to her actuarial co workers. I bought it as a gift for my brother-in-law. I haven't given it yet, so I can't comment on durability, but it looks great! Great quality, nice heavy mug, well made. Gave this as a gift to my best friend, who was a Math major in college and is in finance. He loved it! Actuary Husband love this mug! Great cup, my husband plans to use it at work for coffee.